How much time do you and your personnel spend searching for an email sent two weeks ago, for a training session happening today? With Rescue Hub, your staff can easily find the training materials they need, and keep everything in one place. With Rescue Hub, your training calendar is more than just a schedule. Your training material, documents, and video can be dropped right into a calendar entry, making it easy for personnel to find related documents without having to find an email that was sent two weeks ago. Rescue Hub makes it easy to make your training more engaging, allowing you to create short skill videos and upload them directly into Rescue Hub. All of this can be done without using public video sites like YouTube or Vimeo. 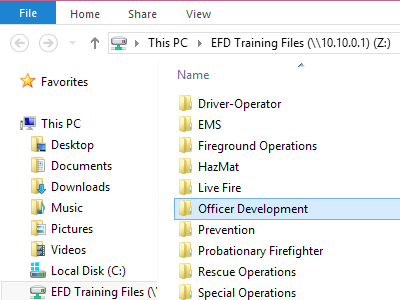 You can easily manage multiple specialty areas, so that your HazMat crews won’t have to dig through the marine operators’ materials to find the documents they need to do their job. With Rescue Hub’s unique task-based system, staff can be easily assigned tasks to be completed at their own pace, such as reviewing a standard operating guide or a NIOSH line-of-duty death report. If checking a box isn’t quite enough to ensure your staff has actually read a document or watched a video, you can create a short quiz to ensure they have read and understand the material. Our tools will help you improve the quality of hands-on training, and give you more time to focus on hands-on practical training. Our clients use the online learning tools to front-load in-person training with introductory material. When your crews can review training material in advance, they can walk into your hands-on drills better informed and ready to practice.